You don’t need a veil, tiara, earrings, necklace and a sash. Accessories add a unique touch to your look, but even one too many can be over-the-top with an already-embellished gown. Before you start buying, take an inventory of your gown’s stand-out features and then base your choices around them. If your dress has an ornate neckline, opt for a pair of drop earrings instead of a necklace (that might look too busy). For a gown with a simpler style, try a bold statement necklace or a fascinator. When it comes to earrings, take a cue from your hairstyle. If you’re leaving your hair down and over your ears, small studs or drops will do. But for an updo, you might want something a little more dramatic, like a pair of chandelier danglers. And lastly, it’s always a good idea to avoid designs that closely mimic the embellishments on your gown—you don’t want to look too matchy-matchy. You’ll want your veil to match the exact shade of your gown. Color blocking is better left to your day-to-day look. Be mindful when choosing a style. If your dress has a lot going on, stick with something simple that won’t steal the spotlight. Consider your size: Longer waltz or floor-length veils will elongate a petite frame while mid-length styles, like fingertip or elbow-length veils, can visually cut you in half, making them a better pick for taller brides. Short styles, like a birdcage or bandeau, work for all shapes and sizes and lend a fun, retro vibe to your gown. Veils not really your thing? From combs to fascinators, there are plenty of other ways to top off your look. Choose your hairstyle before you pick your accessory, since some types will look better with updos than others. A flower crown, for example, is best with loose locks. You should also consider your hair type—dainty accessories may be perfect for fine hair, but won’t be as noticeable with thick waves. Most importantly, make sure whatever you pick feels secure while you’re moving around. Looking for a super-simple way to add a bit of personality to your wedding dress (and help create the illusion of curves)? Add a belt or sash. Just because your dress doesn’t come with one, doesn’t mean it won’t look great—a fashionable fastener is an easy way to customize your gown and change its look without having to make expensive alterations. And whether you go with a classic satin sash or a metallic leather belt, it’ll give your dress an instant upgrade. The key to choosing the right waist-cincher is to find one that works with your body type. Thin belts are best suited to short torsos, while wider belts work well with longer ones. If you’re an apple shape, think about a beaded or heavily embellished belt to flatter your midsection. If you’re petite, a belt with V-shape appliqué will elongate your body. As a general rule, stick with a style that’s no more than three-inches wide—you don’t want to overpower the rest of your gown. No outfit is complete without the perfect pair of shoes—and your wedding day look is no exception. Of course you’ll want a killer pair to go with that gorgeous dress, but that doesn’t mean you have to compromise on comfort. Don’t forget: You’ll be standing for long periods of time, and you don’t want to be cringing in pain before you’ve even hit the dance floor. While shopping, consider the height of the heel (obviously the taller you go, the higher the pain potential), the type of straps and the material. Your feet need to be well supported (think: ankle and toe straps over slip-ons) to avoid instability. Look for high quality, natural materials. They’re infinitely more comfortable than synthetic ones and are also a lot more durable, meaning you’ll be able to wear them again. A stylish cover-up is a must if you’re getting married during the cooler months or at a house of worship that requires you to cover your shoulders. From boleros to capelets and fur stoles, the options are endless. The key is to choose one that strikes the perfect balance with your gown. Simple, understated styles can be paired with more embellished cover-ups, like a beaded capelet with scalloped edges or a bold sequined or feather bolero for added personality. For already ornate gowns, try a more minimal accent to avoid looking too over-the-top. A delicate lace jacket, sheer tulle cape or a chiffon wrap will keep you warm without competing with your gown. Another option? A classic cardigan, the perfect complement to a rustic or more laid-back affair. Sweetheart or strapless: For something a little different, skip the necklace and focus on an elegant pair of chandelier earrings instead. Wear clear crystal for a sleek look, or add punch with a hint of color. Try using a meaningful gem, like your birthstone, or pick a hue from the flowers in your bridal bouquet. If you’re going for a flirty, fresh look, include two or three small fresh or silk flowers in your hair to add a soft, organic feel. Vintage elegance more your style? Pay homage to the past with an art-deco-style bracelet or some Roaring Twenties–inspired feather barrettes. V-neck: Whether you opt for a pendant or a choker, this style begs for a little décolletage decoration. A thin chain with a simple pendant, like a locket, is an elegant way to accessorize, while pearls (single- or double-stranded) are always a classic choice. If you’re going for a more decadent look, a crystal choker or statement necklace with matching earrings could be the perfect combo. Although it’s a special day, don’t stray too far from your normal style. 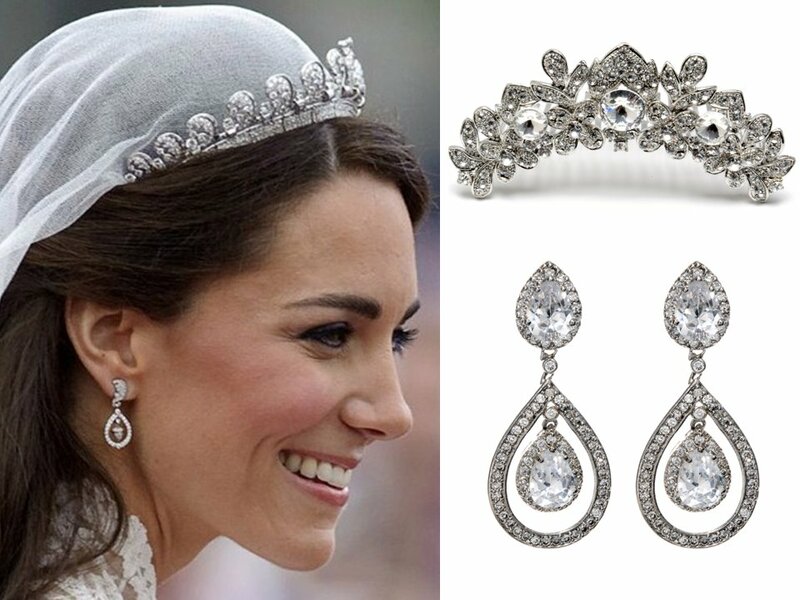 If you rarely wear jewels, there’s no need to drown yourself in diamonds on your wedding day. The goal is to look like the best, most beautiful version of your regular self.